Problems following an upgrade to Mountain Lion on a 13-inch, Early 2011 MacBook Pro (MacBookPro8,1 with Intel HD Graphics 3000). With Google Chrome, I was watching YouTube video fullscreen – Flash content. In the middle of video, I wanted to exit full-screen mode but neither the keyboard nor the trackpad worked. The video continued playing fine. At last, I forced the system to close and restarted. Today I was just chatting in Messages and suddenly everything froze. I was able to move the cursor but nothing was happening. Has anyone else faced this issue, or found a solution? Update: If I connect my mobile phone (HTC Wildfire S) to my MacBook Pro using USB, the Mac freezes every time while removing the USB connector. a more generic edition of this answer appears under How do you get system diagnostic files from OS X? The symptoms you describe are familiar but not commonplace and in my case, not frequent. force a restart of the computer (Command-Control-Power). if that file or folder exists, move it to a convenient place – your desktop, maybe. Whilst I don't encourage carelessness, you can be a little careless with Control-Option-Command-Shift-. … if you struggle to avoid the fn key on your laptop, don't worry; including it by accident should not prevent the run of sysdiagnose. Hint: someone might like to ask a separate question about analysing the results of sysdiagnose – a more generalised answer could be useful. some part of the routine could not complete. Presence of a sysdiagnose_….tar.gz file indicates that all parts of the sysdiagnose routine completed, and that the results were archived. 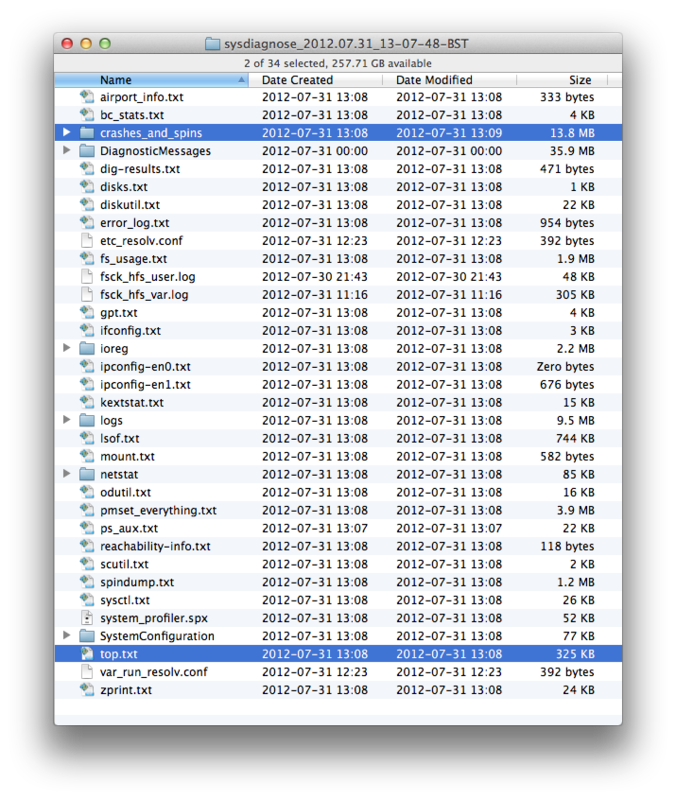 If you wish, open the archive – its contents will appear as a folder. In the first screenshot below – an example of a completed run of sysdiagnose - I have selected two of the items that may be of interest in a case such as this. Note that it may be normal to find at least one empty file. Amongst the .crash, .hang and .spin files – or in the top.txt file – might be a good sign of what was wrong shortly before, or during, the period when you lost control of the computer. This is because of the Android File Transfer App. Uninstall it and the problem will go away. Still I think google should address this..
Not the answer you're looking for? Browse other questions tagged macbook mountain-lion usb hang . How applications behave with Matrox Dualhead2go? Is there a known issue where USB audio sounds for a few seconds then stops?